It’s been awhile since I’ve fed my craving for Asian Box, but finding myself in the heart of Palo Alto with a growly belly yesterday, I headed to Town & Country for a fix. Expecting less of a crowd than the out-the-door lunch-time insanity, I was surprised to find the place not only quiet, but closed when I rocked up mid-afternoon. What the what?! When did this happen?! Asian Box 2.0 is almost ready for release. Turns out that the closure was temporary, as the Asian Box folks were in the final stages of a refresh on their primary location, which is now five years old. Fortunately one of the Guys in Charge saw me standing in front of the door looking bewildered and informed me that the takeaway window around the corner was open for business. Phew! I was a bit disappointed to find that I wouldn’t be able to order my usual (one of the great things about Asian Box is being able to customize your order). With the construction going on, the kitchen was indeed open, but limited the menu to four “special boxes of the day” that didn’t allow much customizing. Upside? The special boxes had a special price of $7 each for the same hearty quantity of food. 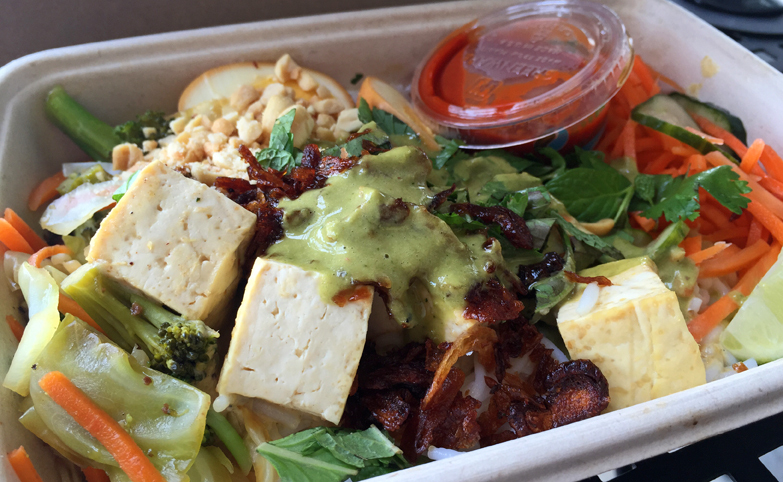 I went with the Garden Box: brown rice, extra tofu, fresh vegetable mix, coconut curry sauce (yum!) all toppers except jalapeno, and the Asian Street Dust. Kudos to Asian Box for their committment to keep things fresh across the board! 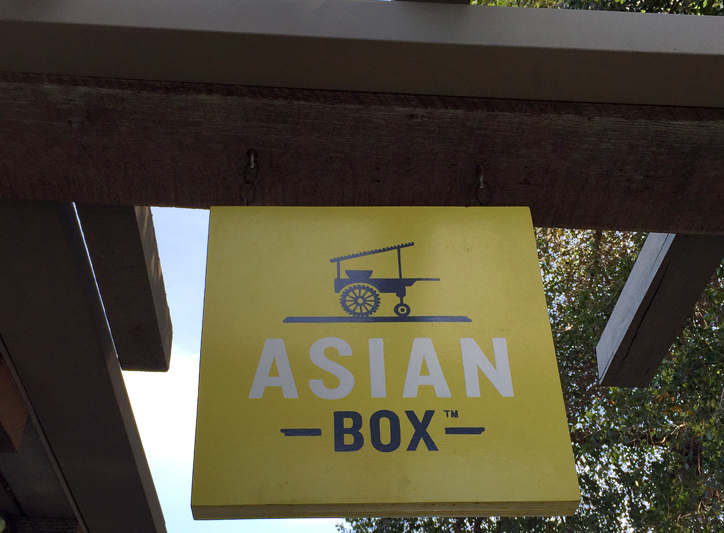 I’m looking forward to checking out Palo Alto’s Asian Box 2.0. Did you happen to visit Asian Box during the remodel? What was your experience? Every time I sat down to write about this place, which is one of my favorite lunch spots, I swear I could hear a bunch of 12-year-old boys guffawing and snickering in the background. Why? The restaurant’s name, of course. Yesterday SF Eater posted a brief article addressing exactly the thing I was dealing with. So thanks to SF Eater, I’m pushing forward. For my Friday Birthday Week Indulgence I ate Asian Box. And I’d do it again. Ok, there, I said it. Now that we’ve gotten that out of the way, let’s talk about what really matters: the experience. “The Box” or “Box” as the three-year-old business refers to itself, is headquartered in Palo Alto, where it opened its first location (they’re now up to five total, including two in Southern California). The restaurant style is casual and family-friendly; customers are greeted with a rousing “Welcome to Box!” from the counter staff when entering the small restaurant. Asian Box’s niche is Vietnamese-style street food, paired with California influence. Ingredients are free of hormones, antibiotics, and pesticides, and sourced locally whenever possible. Not only is Asian Box following a model in which they’re part of the local food system, but they’re also looking out for the environment. The containers in which food is served are either compostable (box bottoms) or recyclable (plastic tops and containers). So, how can you get yourself some Asian Box? In the 650 you can find an Asian Box restaurant in Palo Alto or Mountain View. Place your order at the counter “for here” or “to go” using the above-counter menu, which makes ordering a box your way as easy as 1-2-3-4. If you’re indecisive or overwhelmed by too many possibilities, try one of the four House Favorites. I’ve noticed that “The Workout” seems to be a popular choice with regulars at the Palo Alto location. 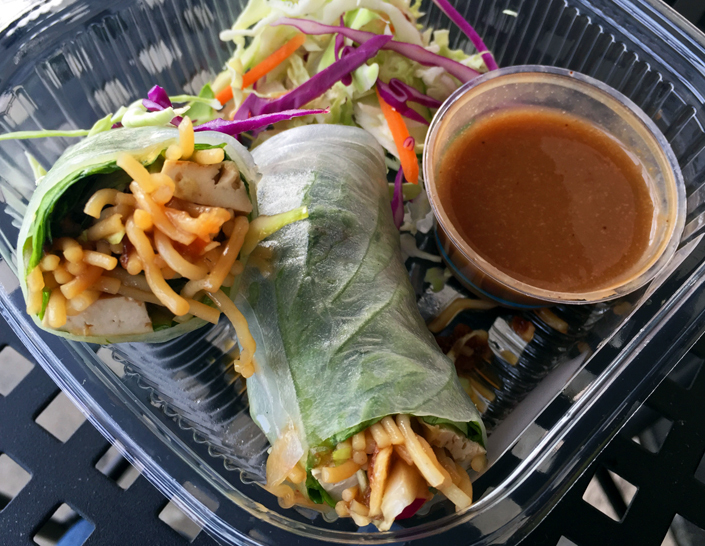 If you’re so hungry that you need to get something in your mouth ASAP, or are just looking for a grab-and-go option, the cold case at the counter has pre-packaged Tofu Spring Rolls, Shrimp Spring Rolls, and Green Papaya Salad, as well as bottled water and non-alcoholic drinks. FYI, the rolls are about 3″ long — just enough for an appetizer, snack, or very small lunch. Tofu Spring Rolls from Box’s cold case: tofu, vegetables, rice noodles in a rice paper wrapper. Served with cabbage salad and dipping sauce. When your box order is ready, counter staff will call out your order number; usually the wait is about 10 minutes. (Note that wait times can be longer during core mealtimes.) Takeaway orders are packaged with utensils and napkins so that you can be on your way. “For here” orders at the Palo Alto location are delivered to your table by friendly Box staff — which is a nice touch if you want to grab an outside table and watch the usual T&C parking-lot shenanigans while waiting for your food. What I love about Asian Box (hehe) is that they offer something for every diet. Whether you’re paleo, gluten-free, vegan, vegetarian, pescetarian, carnivore, whatever — Box has got you covered. And you can change it up every time! My current favorite combo is rice noodles with tofu, caramel egg, all toppers — except bean sprouts (yuck) and jalapenos (overkill with the sriracha, in my opinion) — peanut sauce, and sriracha sauce on the side. As indulgences go, this is one I won’t limit only to birthdays. In fact, writing this post has given me a craving for Asian Box, so I might have to venture out to the Town & Country this weekend for some satisfaction. Have you tried Asian Box? Wanna share your experience? Tell all in the comments below or on 650Food’s Facebook page, where you can also check out photos of the other Birthday Week Indulgences. You are currently browsing entries tagged with paleo fast food at 650Food.